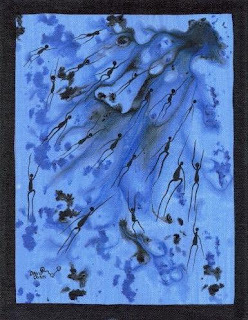 " SPIRITS OF THE WATER "
REVIEW OF MY PAINTING; Well known among the Aboriginal artists for his clarity of style and vivid use of colour. David is a talented artist whose works have toured Australia. Several art collectors overseas commissioning David to paint larger paintings for there own collections. These painting are filled with a true artist's' impression of the Australian outback. It is difficult to believe that this art can be created using a brush alone but it has and this is a testament to the skills of David Dunn. David's paintings usually combine traditional Aboriginal dot painting techniques and modern contemporary Aboriginal art. Each of his paintings has a meaning that goes beyond what is depicted, for instance in a painting the color of the dots signify a part of the natural landscape and also have a reference to the dreamtime. Interested collectors may wish to peruse the stories attached to other paintings that David has done in order to gain further insight here. In Adelaide, in South Australia, these paintings have been creating a sensation with many keen buyers asking for private viewings and snapping up the art.